This weekend I was excited to hear that my family had no strong opinions regarding what to do on Saturday afternoon, because I was able to drag everyone to what I wanted all along - watch Moonrise Kingdom and eat dinner at The Porch in Dallas. I especially loved the mod/prepster style of the costumes, and Suzy's dresses really made me want to bust out some blue eyeshadow, saddle shoes and find a mini dress with a big collar and cuffs. Luckily, the internet is really helpful in that regard. I couldn't find an exact copy, but I'm sure they'll be on Etsy in a couple of weeks! P.S. 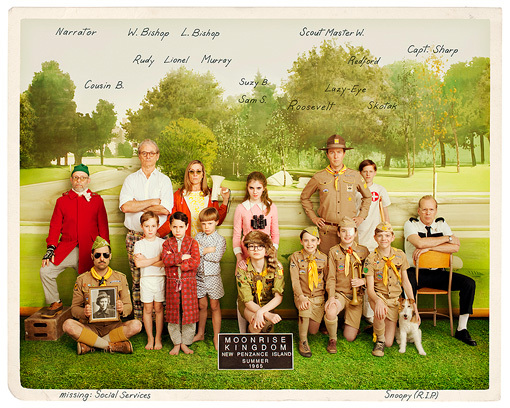 I love that Wes Anderson had the child actors and actresses do their own hair and makeup so it would look authentic. How fun is that?